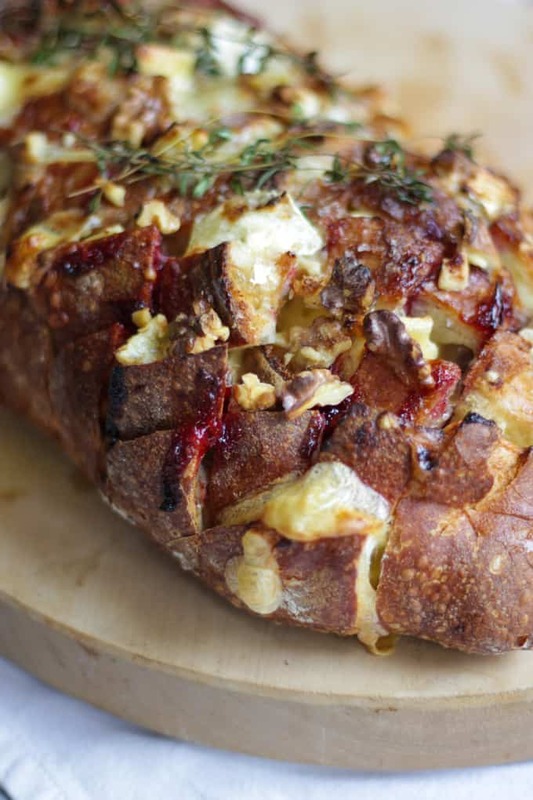 Easy and delicious Brie and Cranberry Pull Apart Bread. The ideal festive Christmas loaf to make for a party. I have to be honest, there’s not many occasions where I couldn’t find a reason to celebrate with carbs and cheese. 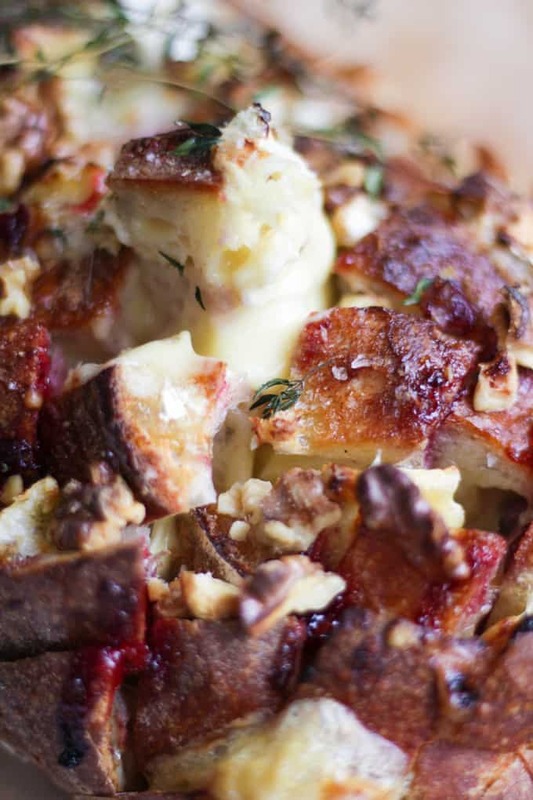 But really, baked brie RIGHT? 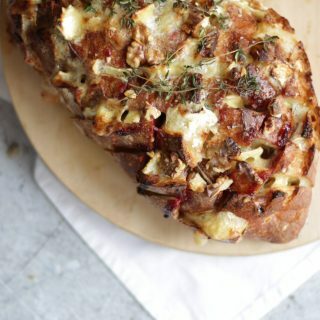 Add in cranberry sauce and it’s basically a festive feast on a loaf. 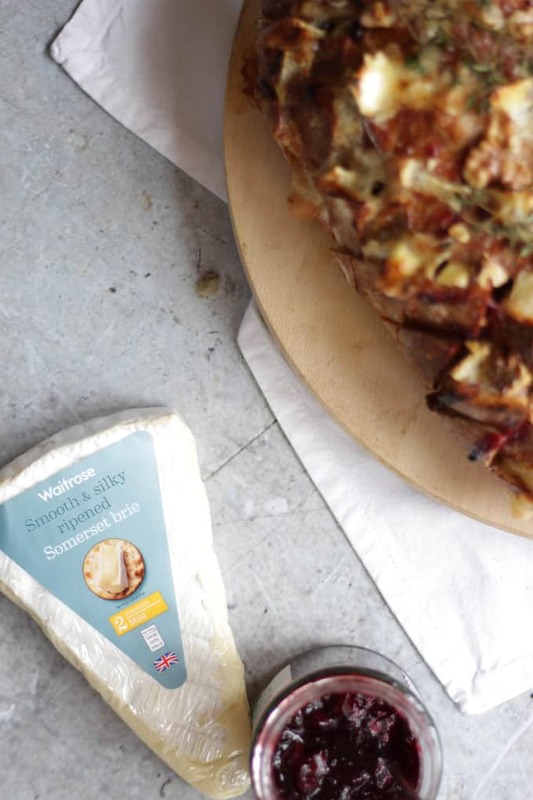 Waitrose asked me to share some Christmas recipes this week (No Bake Baileys Cheesecake anyone?). They wanted to know about food that inspires me to celebrate the festive season with loved ones and friends (more on that in a moment). This year has seen lots of change for me, but one of the best things to come out of the last twelve months is understanding the value of true friendship. Those relationships where people will drive a fifty miles late at night just to give you a hug, or the naughty friends who take you out dancing until 3am when it’s the last thing you felt like, but the thing you actually really needed. I’ve always been a feeder, showing my love with elaborate meals, but it’s dawned on me recently that sometimes simple food and great company is all that’s needed (oh and molten cheese of course). 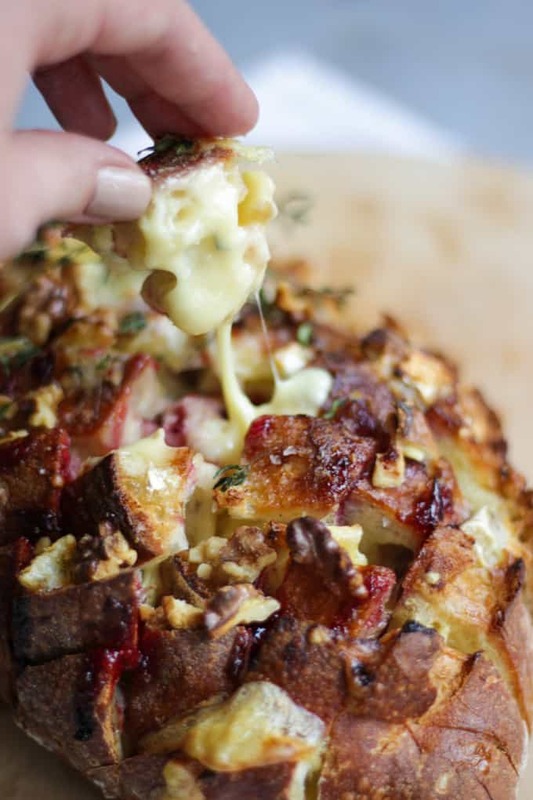 So, I present you with my Brie and Cranberry Pull Apart Bread. Simple, delicious and made for sharing. Tell Waitrose how you are enjoying #ChristmasTogether and you could win an amazing prize or experience to share with a pal. All you need to do is share a photo on Instagram, Twitter or Facebook of how you’re spending #ChristmasTogether (using that hashtag and tagging them). Please pop over and read more about #ChristmasTogether from Waitrose. I would LOVE for one of my readers to win! 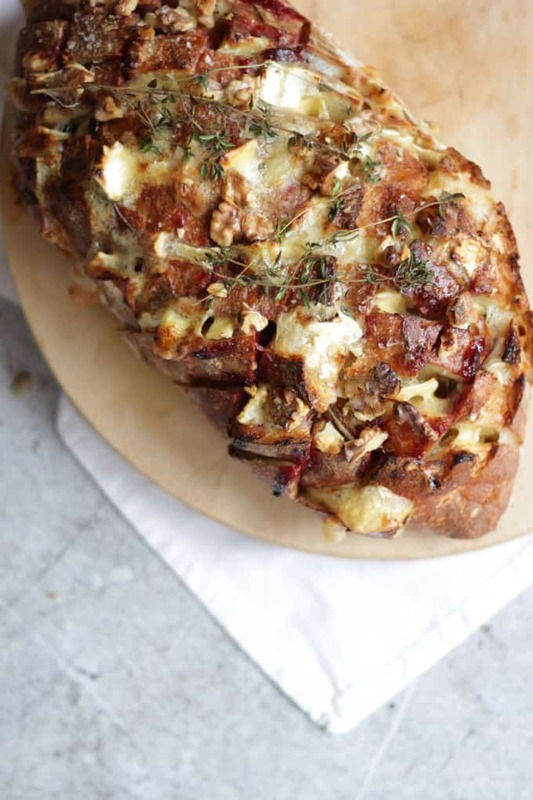 Be sure to use a dense sourdough loaf for this recipe (available from Waitrose of course!) You need the texture to hold up the gooey cheese without going soggy. Squish in as much brie as possible. There can never be enough melted cheese. FACT. Be generous with the sea salt, it really sets off the sweetness of the the cranberry. Some springs of thyme on top look pretty but not essential. Serve immediately with a spoon and bread knife on the side to help people pull out a piece. 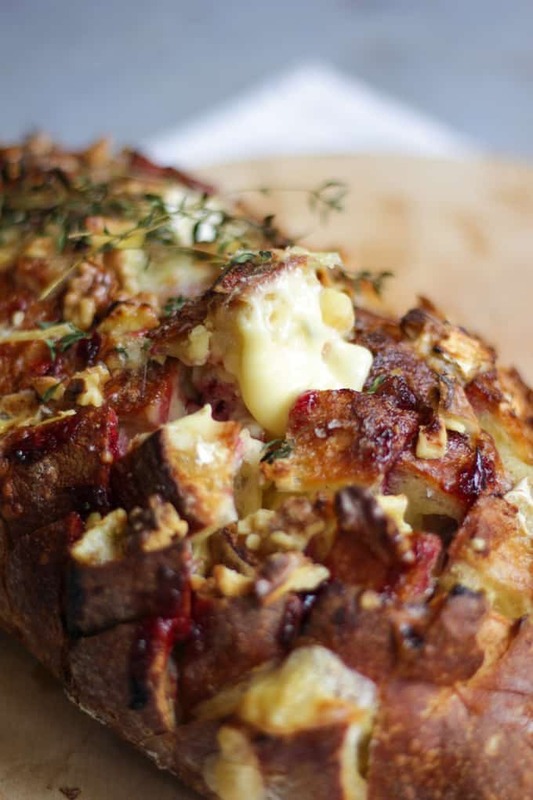 Easy and delicious Brie and Cranberry Pull Apart Bread. The ideal festive Christmas loaf to make for a party or for Thanksgiving. Cut the loaf in diagonal criss crosses, stoping before you reach the bottom of the loaf, so it remains attached together. Using a table knife, spread cranberry sauce into each of the slots you sliced. Press chunks of brie into each of the slots. Pop onto a baking tray and drizzle with olive oil, add a generous sprinkle of sea salt and the walnut pieces. Top with thyme if using. Pop into the oven for 10 - 15 minutes until the cheese is melted and golden.